Ellison’s was on northwest corner of the intersection of Main Street and 2nd Avenue. The original Ellison’s was the second building to the north of the intersection. After they acquired the building to the south, Ellison’s doubled the size of the building to what it is now. Ellisons had a restaurant/cafeteria on the second floor, overlooking the shoppers,. They also had an elevator… probably one of the few in Minot way back when. I have been informed that Ellisons also had tubes running to the various cash registers… similar to those used by drive up banks today. The tubes in Ellison’s were transparent so you could see the money moving through them. today. Ellison’s planned a three story department store with another two floors of office space on top. The first three floors were built but not floor 4 and 5 as George Vaulker started building his office building on the northwest corner of 1st Street and 1st Avenue Southeast. Thinking there would be a surplus of office space, the Ellison Building remained at only three floors. The restaurant in the Ellison Building was pn the second floor. The Vaulker office building was never completed. Twenty years later Clarence Parker bought the unfinished building and converted it to the Clarence parker Hotel. I and my girl friends had lunch in the restaurant on the mezzanine almost every day during the school year! Remember the really good bean soup? In 1961 I think it was 15 cents for a bowl! I am enjoying your blog. 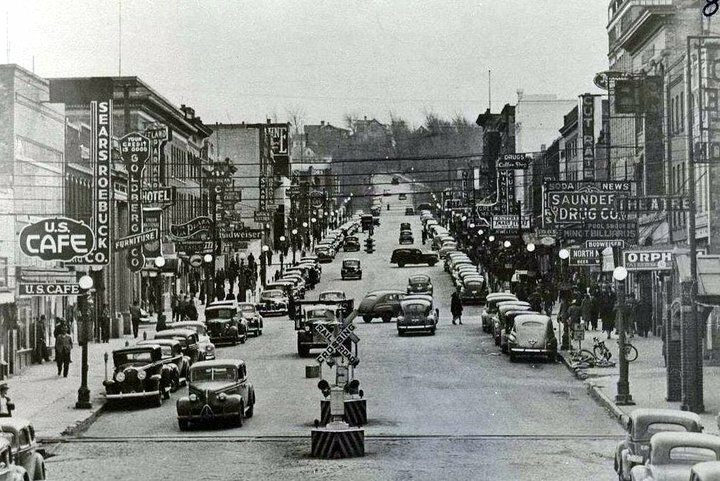 I was born in Minot in 1962. We moved when I was 2. We moved back when I was 6. We moved again but returned for a final time for one year when I was in 6th grade. I have fond memories of my Grandma taking me to Ellisons and having a fancy lunch in the department store. Can you find out anything about the 250 club? It was something the PE teachers did and you had to get 250 pionts, and if you did you got a tee-shirt. I was proud of my shirt. 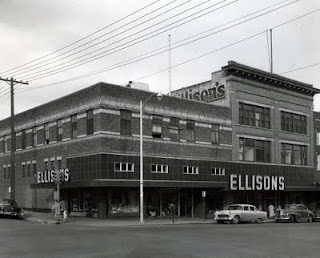 My mother, my aunt and my grandmother all worked at the Ellison Department Store for many years. ( 1946 to 1970) So many wonderful memories of the luncheonette and all the special lunches there. I visited there recently (2010) and now see that the store has been turned into many little shops and a very good deli. As I ate my lunch there once again; I could still feel the "family" atmosphere that Mr. Ellison was so careful to maintain. Mom bought all my dorky clothes there. No wonder I was bullied at Jim Hill. I went to Eric Ramstad jr High from 1964-66. I wish I knew the name of the cafeteria where we would all have lunch on a Saturday. You had to walk down a long row of stairs to the basement. The macaroni salad was the best.